Help Golldir save his aunt and stop a necromancer from defiling his ancestral barrow. Talk to Golldir outside Hillgrund's Tomb. Accompany him as he tries to rescue his aunt Agna from Vals Veran. Find a way into the room where Vals Veran is hiding. Within the antechamber of Hillgrund's Tomb, you'll encounter a Nord named Golldir. He explains that a necromancer named Vals Veran is inside his ancestral barrow, defiling it. His aunt Agna went in to put a stop to this, but Golldir was too scared to go with her. If pressed, he will explain that he has been terrified of the barrow ever since his father locked him in it as a child. If you accept, he will accompany you into the barrow to help rescue his aunt and kill Veran. The tomb is very linear and any offshoots are only small, dead-end rooms. As you continue down the stairs, draugr will attack in small waves. Several varieties will be present in each wave. Like all normal barrows, exploration into the burial sites will lead to more attacks as entombed draugr come to life. Golldir may raise a vocal objection to you looting his ancestors, but concedes to allowing it since you are helping him. There is no chance of successfully rescuing Aunt Agna; at the bottom of the room you'll find her corpse. The door to the burial chamber where Veran is located is barred shut. With more resolve, Golldir will lead you through the abandoned section of the barrow to find a secret way into the chamber where Veran is hiding. This section is full of his disgraced ancestors and the draugr numbers are larger here. Stronger varieties of draugr are entombed in the walls, but should only appear singly. After passing through a room with a single spider ambush, a simple puzzle will present itself. In order to pass it, the plaque with a bear on it must be located. A chain hanging from that plaque will open a secret door that leads to the main chamber. If you've had problems up until now, this next area may prove very troublesome. The room is a large tiered burial chamber with sarcophagi all around. As you approach the top, Vals Veran will come out and start speaking of death's beauty. Whether you try to talk to him, attack him, or let him finish his speech, he will eventually disappear and teleport across the room. Attacking him at this juncture is futile as he will simply teleport across the room and heal. If you are quick, you can kill him with a single power attack before he teleports, but you will still need to fight off the waves of draugr. You can also kill him using a sneak attack almost as soon as you enter the room, if your Sneak and Archery skills are high enough—but once again, you'll still have to deal with all the draugr. A goal is also to keep Golldir alive through the battle, to earn the gold reward. If you don't manage to kill Veran instantly, you'll need to focus instead on the waves of draugr. They can quickly swarm you and any followers while Veran casts damaging Frost magic from afar. The third wave of draugr will contain a boss-level draugr that must be dealt with. After dispatching it, Veran will continue to summon more draugr (but in lesser numbers), but most importantly, will stop teleporting. He can now be hunted down and killed. Golldir will thank you for your help and state that he will remain close by the tomb and spend his time hunting. Killing Vals Veran will grant you the Hillgrund's Tomb Crypt Key, which can be found on Veran's body. The highest reward is only granted if Golldir is kept alive. If he survives, he will give you a large leveled amount of gold and a Hillgrund's Chest Key, which opens an augmented loot chest, located just beyond the main burial chamber (where the battle with Veran took place), through the door at the top of the stairs. Beyond the chest is the barred door leading to the room in which Aunt Agna's body was found. If you do not receive this key, you can loot it from Golldir's corpse or just pick the expert-leveled lock on the chest. After you exit the tomb you can speak to Golldir again (if he's alive) about becoming a follower. This dialogue option will not open up until after you leave the tomb. If you are a Dunmer, Golldir will comment "No offense, I mean...I'm sure you aren't into any of that kind of stuff" after he speaks of Dark Elf necromancy when explaining what is going on in the tombs. If Golldir sees you looting items from his family tomb, he will say "Hey! Those belong to my family! Sigh... fine, take whatever you want, so long as you help me get rid of Vals." The Note from Agna says that Golldir was locked in the tomb by his brother, but in dialogue Golldir says it was his father who locked him in. If you are having trouble dealing with the draugr swarms during the final battle, you can lure them back to the secret door and pick them off one at a time, since the draugr are unable to pass through the door. After reaching Vals Veran and after the brief dialogues between Veran and Golldir, Veran disappears with an invisibility spell but may never come back. If so, then only the initial attack from the draugr will take place. Something may trigger his appearance script again, but once again he becomes invisible forever. ? If Golldir is killed, the quest will still act as if it's active and that you can still "talk to Golldir" to finish the quest. The quest marker will even hover over his dead body. 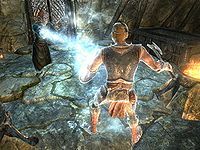 It is possible that Golldir may drop his war axe and shield in the battle before entering the main chamber, if a Draugr Deathlord uses the "Unrelenting Force" shout on him (or if you do accidentally). If this occurs, he will not pick them up again, even if you drop a weapon and shield in front of him, although he may pick up a different weapon in the battle with the Draugr in the main burial chamber. 10 I've agreed to help Golldir protect his ancestral tomb from the warlock, Vals Veran. The following empty quest stages were omitted from the table: 0, 1, 2, 5, 15, 20, 30, 35, 36, 38, 40, 45, 50, 80, 81, 95, 101, 200. On the PC, it is possible to use the console to advance through the quest by entering setstage dunHillgrundsTombQST stage, where stage is the number of the stage you wish to complete. It is not possible to un-complete (i.e. go back) quest stages, but it is possible to clear all stages of the quest using resetquest dunHillgrundsTombQST. This page was last modified on 18 June 2017, at 13:02.